Hickory Dell Farm in Northampton has been run by three generations of Omasta's. Faye and John are experts in raising cattle, llamas and growing vegetables. You will find them at the Springfield Farmer's Market each Tuesday afternoon. This is their recipe for a more heart healthy version of pesto. I just love it. It is fresh and flavorful without the decadence of the traditional recipe. blending. Add cheese and pine nuts (can reserve half to mix in by hand if desired) and blend. Add vinegar or lemon. Add oil to desired consistency. Add to one pound of hot pasta. Sprinkle with nuts, if reserved. Serve with additional grated cheese if desired. small amount of oil on top and add a drop of vinegar (dill or other flavor). Cover and freeze. Spring is in full bloom and I am thinking about the Farmer's Market @ the X and all of the early season gifts to find there. If you have time on Tuesday afternoons it is a must stop. 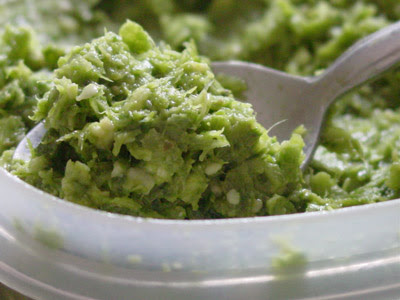 This recipe From Red Fire Farm is a flavorful take on traditional pesto. It is terrific in the spring when the garlic scapes are thriving and fresh basil is still only a dream to come. Place all ingredients in the food processor and blend until smooth. Use on pasta, pizza or sandwiches.